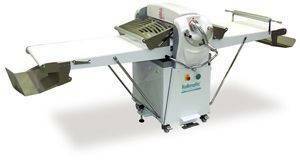 The pre-eminent model in the manual sheeters range, it has the very highest performance and productivity standards. Optional cutting set and variable speed using an inverter to obtain the best production results in any situation. Removable folding tables for easy belt maintenance. Stainless steel protection grid with safety microswitch and gas piston lifting system. Built to meet the expectations of the more demanding bakers, thanks to its large rollers and wide opening.